Tips and tricks for transforming your exterior living space. From front doors to patio floors, exteriors are a wonderful place for adding style and character to your home. We have gathered our favourite tips and tricks to help you transform your outside into an inviting alfresco space, which effortlessly reflects your own style. Make a first impression last with your exteriors. As your exteriors are the first thing you and your visitors will see when they arrive, it’s important to pick the colours you love. 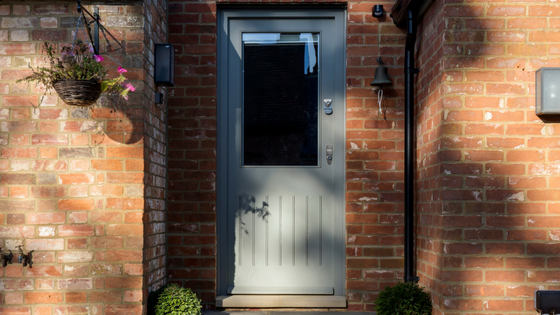 This is especially true of front doors as this is the perfect place to make a striking statement. Your exterior entrance sets the scene for your interiors. Overall, it’s best to go a shade or two darker than you would within your home as exterior colours are mostly admired in natural daylight. There is a variety of bright paint pigments available. We love Little Greene Paint’s Intelligent Exterior Air Force Blue, Milk Thistle, and Hick’s blue, which will create a subtly cohesive and understated feel in the garden, helping your blooms take centre stage. For something a little bolder, inject striking hues like Carmine or Carys into your outdoor living space. Think about your exterior surroundings. If your home is nestled in a Victorian terrace or cobbled mews, it’s worth being mindful of the style of neighbouring buildings. Have they opted for natural limestone for their entrance or decorated their porch step with patterned tiles. It maybe wise to follow suit and invest in exterior limestone. 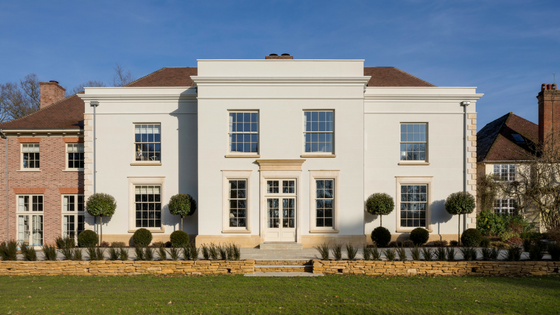 Limestone is perfect for those seeking a low maintenance exterior solution. The stone’s porosity gives it a non-slip quality and its durability means it has good resistance to damp and weather inclemencies. If you want to add some colour to your front porch, patterned porcelain tiles are the way to go. Like limestone, porcelain needs little maintenance and can have an added non-slip layer, perfect for external use. For rural settings, you may wish for your exteriors to blend seamlessly into the natural surroundings. Slate tiles are great for creating that natural look. Slate has a timeless appeal and wears beautifully over time. Of all the stones, slate is the most characterful, especially with a textured riven surface. Consider the architectural period of your property. 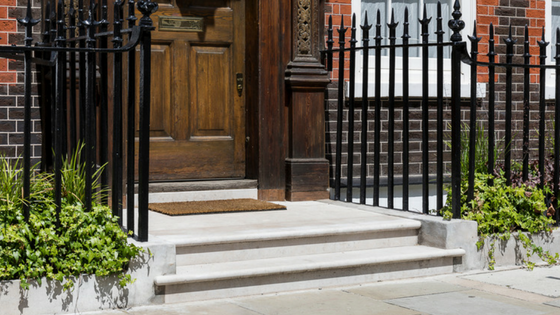 The architectural period of your property is relevant when choosing your exterior paving. 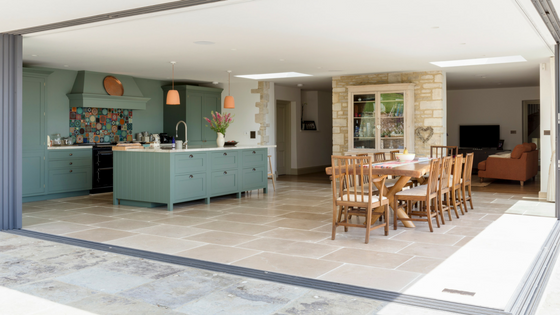 Elegant country homes suit characterful limestone slabs, while rural rustic retreats blend into their environment with natural riven slate. For modern homes, smooth exterior porcelain tiles look super sleek and add a contemporary finish. Choosing the same floor tile for the interior and exterior of your home is a lovely way to create a cohesive scheme. A contemporary looking limestone is perfect for creating that indoor/outdoor look, and feels luxurious underfoot. A smooth limestone will really connect your outdoor with your indoor living space. The cohesive design can often make a room feel bigger as it seamlessly extends from your interiors into your outdoor space. To complete the look of your exterior, invest in comfortable and attractive furniture. Create a beautiful outdoor living space worthy to be in your living room. Because of the advances in furniture technology, it’s possible to have fully upholstered furniture outdoors. Accessories your outdoor space with a textured pattern rug, lights and green foliage for that alfresco, tropical vibe.